Sam had a bad start to life. He was left to guard a “grow shed” on the property behind ours. He had no contact with people or other dogs. He went without food & water and finally contracted parvo. We had been feeding him and giving him water through the fence (I broke out 2 panels that I could slide back in place after he was fed & fussed). My wife & I contacted the police on numerous occasions & eventually he was taken to the vet. Making a long story short we adopted him and have had him one year this weekend. It had been 19 years since our last dog (a border collie spaniel retriever mix) which broke our hearts when he passed. We dog-sat many dogs over the years, but having our own since moving to America 12 years ago was not feasible due to apartment living, job relocation etc. We would have never thought of having a German Shepherd, but it was not our choice it was fate. We soon moved after rescuing Sam and now we have the best dog we could ever wish for. He was 66lbs a year ago when we first had him, now as you can see he is a healthy 89lbs & will be 3 years old next March. He loves children, all other animals & makes us smile every single day. 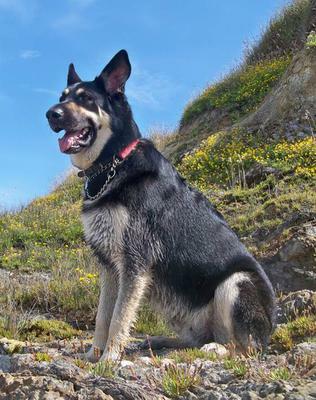 Please consider Sam for your GSD of the month. Sorry to hear of your wife. Sounds like there was no mistake in the gsd coming into your life. Sue passed away suddenly on 20th October 2014. He is my connection with Sue, my life, my rock. This is the epitome of: So who saved who? He is beautiful, and so are you for rescuing him. Thank you. Although my own GSD is a black and tan, I have always had a special place in my heart for the black and silver. Close family next to ours when I was growing up had a black and silver named "Pal." He was fantastic and so good around so many running around, yelling, playing kids.